SQL stands for Structured Query Language. It is used for storing and managing data in relational database management system (RDMS). It is a standard language for Relational Database System. It enables a user to create, read, update and delete relational databases and tables. All the RDBMS like MySQL, Informix, Oracle, MS Access and SQL Server use SQL as their standard database language. SQL allows users to query the database in a number of ways, using English-like statements. Structure query language is not case sensitive. Generally, keywords of SQL are written in uppercase. Statements of SQL are dependent on text lines. We can use a single SQL statement on one or multiple text line. Using the SQL statements, you can perform most of the actions in a database. SQL depends on tuple relational calculus and relational algebra. When an SQL command is executing for any RDBMS, then the system figure out the best way to carry out the request and the SQL engine determines that how to interpret the task. In the process, various components are included. 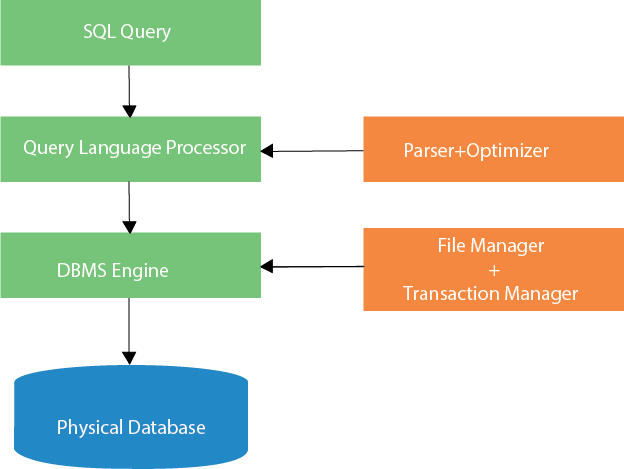 These components can be optimization Engine, Query engine, Query dispatcher, classic, etc. All the non-SQL queries are handled by the classic query engine, but SQL query engine won't handle logical files.